The Cuisine Diploma has been a stepping stone for Alexandru, who graduated in 2012 from Le Cordon Bleu. Continuing his passion for cuisine, Alexandru competed in the 2014 “Villeroy and Boch” Culinary World Cup, returning with a silver medal. Of Romanian nationality, Alexandru Scotini chose Le Cordon Bleu Paris to make his dream, of working in the cuisine industry, a reality. Following graduation in 2012 with a Cuisine Diploma, Alexandru carried out an internship at the prestigious La Tour d’Argent restaurant where he worked alongside Laurent Delarbre, One of the Best Craftsmen in France (Un des Meilleurs Ouvriers de France - MOF) 2004. He then went on to work at Passiflore restaurant under Chef Roland Durand – One of the Best Craftsmen in France (Un des Meilleurs Ouvriers de France - MOF) 1982. 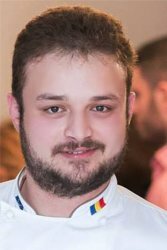 Alexandru then decided to return to his home country to join the teams of Nico Lontras, finalist of the Top Chef Romania television show. In 2014, he took part in the “Villeroy and Boch” Culinary World Cup where he won a silver medal.